Yorkshire Cancer Research is urging smokers in Yorkshire to quit by using e-cigarettes. There are no identified health risks of passive vaping to those around you. This is very different to the strong evidence of harm caused by breathing in second-hand cigarette smoke. Tobacco smoking is the leading cause of early death in Yorkshire – responsible for 16 different types of cancer, including 72% of lung cancers, 44% of bladder cancers and 20% of liver cancers. E-cigarettes do not contain tobacco. It’s important to remember that because e-cigarettes have only been around for a relatively short amount of time, just like with any new product, more research is still needed into any possible long-term effects. But for the moment, we have to work with what we know – like the fact that half of all long-term smokers will die as a result of their smoking if they don’t quit. We want to make sure all smokers have all the information they need to make an informed decision on how best to quit. 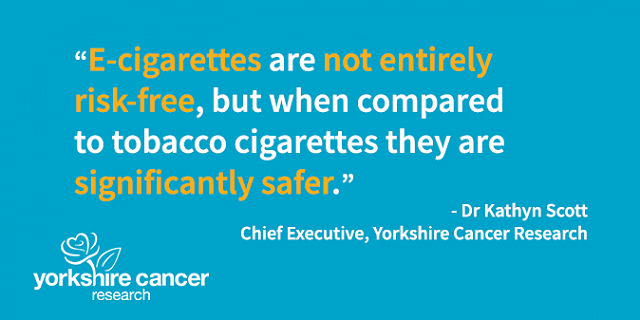 By spreading the message that vaping and smoking are not the same activity, and outlining vaping’s value as a tool to quit we can bring down the smoking rate in Yorkshire and reduce the number of people in the region who are needlessly dying through smoking-related cancers. We know that there is a lot of confusion surrounding e-cigarettes, so we’ve pulled together a Q&A blog post to help you understand more about their relative safety. Because of the key differences between vaping and smoking, imposing a blanket ban on all workplace vaping may not be the best way forward for an organisation. In fact, treating vaping and smoking as the same thing and forcing vapers and smokers to share the same designated space may actually jeopardise people’s attempts to quit. For advice on how to approach vaping in your organisation and ultimately how to keep your workforce as healthy as possible, take a look at our workplace guidance in the Campaign Resources list below.